Never Miss Any Updates! 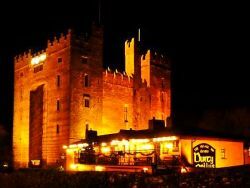 Subscribe Here And Receive Free Access To Our Irish Castles E-Course! I promise to use it only to send you Enjoy Irish Culture ezine. So, you think you know your history of Saint Patrick? Find out if you do! 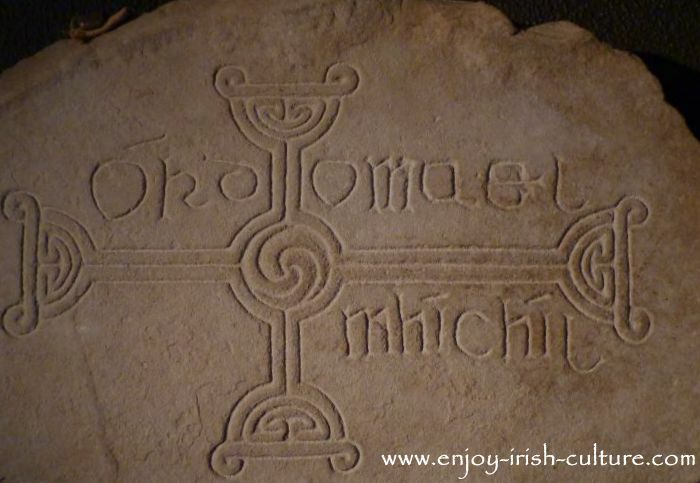 An early Irish Christian cross found at Clonmacnoise. Take our ten question quiz on our beloved Patron Saint, St Paddy. Then find the answers below and finally, rate how well you did! Saint Patrick was Irish. True or false? Saint Patrick used the shamrock to explain the holy trinity to the Irish people he was converting. True or false? Saint Patrick brought Christianity to Ireland. True or false? Patrick converted all Irish to become Christians. True or false? Saint Patrick used bribes and gifts to bring the Irish onto his side. True or false? Saint Patrick was an uneducated man. True or false? Patrick was a slave in Ireland and in slavery he worked as a shepherd. True or false? The reason there are so many legends surrounding Patrick is that later church authorities and political powers hijacked his story and rewrote it in order to claim his legacy for themselves. True or false? Patrick banished the snakes from Ireland. True or false? Saint Patrick was a bishop appointed by the Pope. True or false? Like this quiz? Give us a thumbs up! Scroll down to find out the answers, then rate how you did! Then use the links provided below to learn more about our Patron Saint! 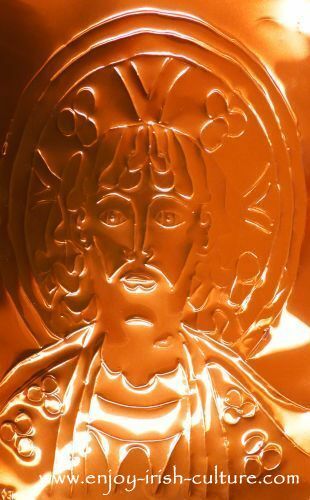 Portrait of Saint Patrick, an embossing created during Susanna's art classes by 9 year old Maeve. How did you do in our quiz on Saint Patrick's biography? 8-10 correct answers: Gee, you ARE Irish! Well done. 6-8 correct answers: You are getting there. Apply again for Irish citizenship in the next round. 4-6 correct answers: Keep practising. An Irish passport isn't everything! You can use the links provided in the answers section and learn more! 2-4 correct answers:That's a start. Wearing green on St Paddy's Day may help? 0-2 correct answers:Don't believe everything they tell you! And check out the articles on Saint Patrick to help your knowledge along. False, he was a Christianized Roman Briton. Find out twelve known facts about his life here. False. This is a legend, based on a story in the Book of Armagh written some 400 years after Patrick, and not based on historical fact. False. There were already Christian communities in Ireland before Patrick, mostly in the South-West and East of the country. find out more about Patrick and Christianity in Ireland here. False. According to his ‘Confession’, Patrick converted thousands. But during his life time and well after it, Christianity continued to be the minority faith in Ireland. Answer: True. He says so himself in his ‘Confession’. Patrick would have faced many adversities in his time as a missionary in Ireland, and local politics with a myriad of local kings were part of this, as well as a general hostility towards him as a bringer of a new, alien faith. He used bribes and gifts to smooth blows and to be allowed to continue his work that he was passionate about. Read more here about how he became so successful as a missionary. The answer is most likely ‘false’. Howlett (1994) analysed Patrick’s use of Latin and found him to be capable of using a number of advanced linguistic tools, with one in particular ensuring that his texts would be passed on accurately into the future. However, Patrick’s early and likely high-quality education would have been disrupted when he was captured and brought to Ireland, so he wasn’t as knowledgeable in philosophy as some of his contemporaries would have been. Find out more facts about his life here. True. According to his own testimony in his ‘Confession’, Patrick spent six years as a shepherd living at a woods near the sea of the setting sun’, i.e. most likely the Atlantic Ocean in the West of Ireland. True. That is exactly what happened after Patrick’s death starting with the 9th century Book of Armagh, and continuing from there. False. This is a legend, and is in no way based on historical fact. There were no snakes in Ireland. The snakes were gone from the last ice-age on. False, believe it or not. Saint Patrick was a self-appointed missionary, and the existing evidence points to him getting in trouble with church authorities for undertaking missionary work in Ireland. Go back to the quiz questions. Such is the history of Saint Patrick! Thanks for joining us in our quiz. Find more fascinating Ireland history facts in our Irish history section. If you enjoyed this quiz on the history of Saint Patrick and if you like what we do on this website, please give us a social shout out in support! This will help your friends to find our content, too. Please use the social options at the top left and bottom. Thanks a million and warmest regards from Colm and Susanna. Return to the top of this page. Like what you just read? Leave us a comment!